This beach was named for a woman (Fat Maria) who was supposedly sed on shore here by pirates, who returned here now and again to visit her between forays. Located on the Guanahacabibes Peninsula, which has been declared a world preserve of the biosphere, Maria la Gorda Beach has left its rather raucous past behind and is now famed for its serenity and sense of privacy. 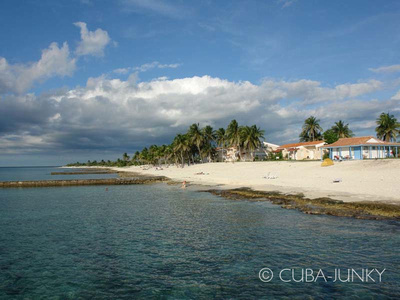 The beautiful beach, with fine sand, is five miles (eight km) long.The seabed here is one of the richest in Cuba in terms of biodiversity and has the largest colony of black coral (Antipathes spp.) in the archipelago. At its 39 scuba-diving sites, you can see gardens of gorgonians, sponges, a long wall with grottoes, abundant marine fauna and artefacts showing that both pirate and merchant ships used to anchor here in the past. Maria La Gorda Beach is on Corrientes Bay, on the Guanahacabibes Peninsula, 93 miles (150 km) west of the city of Pinar del Rio and 188 miles (304 km) from Havana. You can reach it by road or by sea, for it has a marina (at 21 49'N. latitude, 84 29.8'W. longitude. For radio communication, turn to VHF 16). 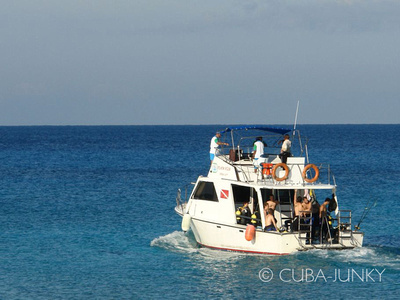 Scuba diving (for both professionals and beginners) is the main activity at Maria La Gorda, together with underwater photography, with modern equipment and assistance from divers whose skill is attested to by the World Underwater Federtion (CMAS). 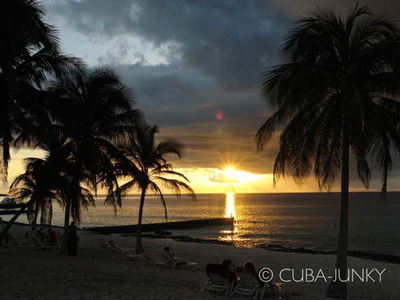 However, the area's tranquility, fine white sandy beaches, many coconut palm treesand setting (with great natural and archeological attractions) offer many other options as well: sunbathing, swimming, other water sports, seafaris, lazig around, reading, hiking, ecotourism, bird-watching, nature walks and excursions to other points of interest on the Guanahacabibes Peninsula. Located in the Guanacahabibes Biosphere Reserve, in eastern Cuba, is María la Gorda (Mary the Fat), where divers can enjoy crystal-clear and warm waters in 39 diving spots. This peaceful islet place is so close to the mainland that a stone causeway has been build to link the two. Even so, it exudes an aura of isolation and is an ideal place for the idea of having the beach to yourself, there are over four miles (7 km) of white-sand beaches and a few people, so you can always find a spot with nobody in sight. It's a lovely destination for a day's excursion. 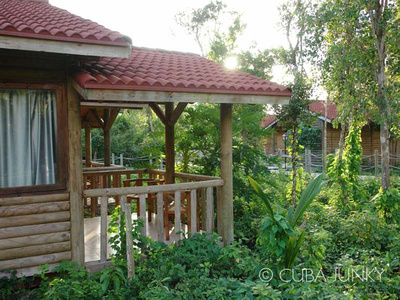 Cayo Jutias is 56 miles (90 km) from the city of Pinar del Rio and about 60 km from Vinales. Take the road that goes to the town called Minas de Matahambre and then the stone causeway.